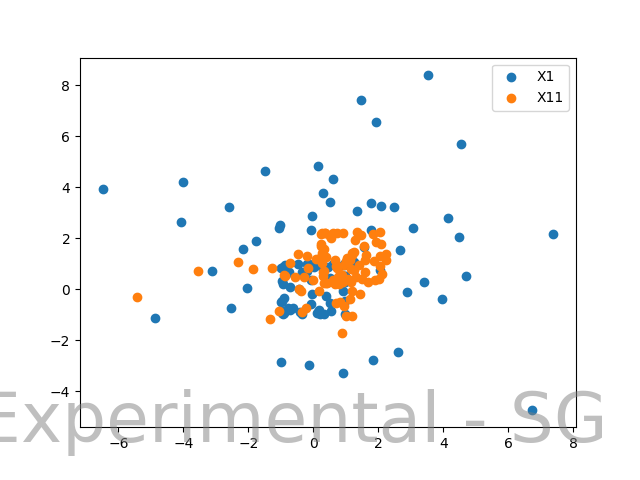 Comparing K-Means and Expectation Maximization on the dataset generated - When does K-Means perform better? I really feel that K-Means was able to capture more points from a particular distribution as compared to EM. Also, I had imagined that EM would be able to create overlapping clusters to distinguish the 2 square formations you see in the dataset plot. What is the intuition behind EM performing this way? Here is the complete code using which I generated these plots. As I generated a lot more data samples, EM was able to give out clusters that were visually much more satisfying. What could be concluded from this? 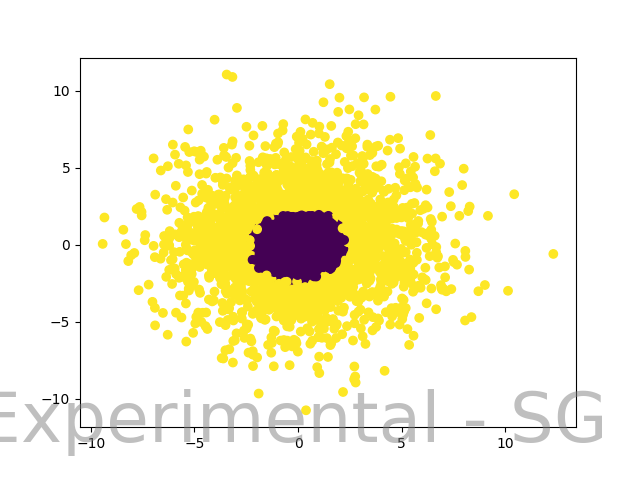 Here is the plot of dataset with much more samples. 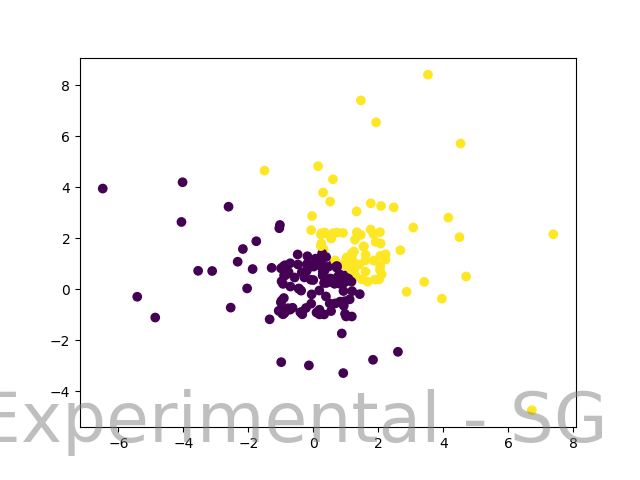 Here K-Means just adds a linear separator, which was expected from K-Means on this dataset. How do we explain the result here? Why was EM able to cluster data better with much more data samples? What the K-means algorithm does is just to follow a recipe: alternate between computing the means of each of the K classes (centers of gravity) and assigning each point to the nearest mean. The outcome is such that only points which are close together are deemed to be in the same class. 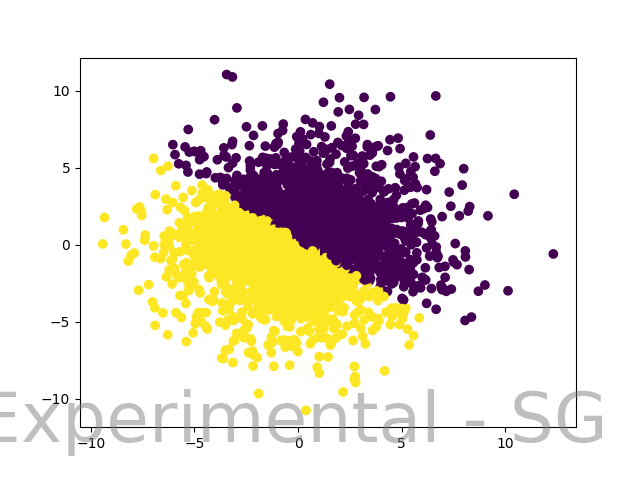 A Gaussian mixture model, on the other hand, assumes that for each datapoint x_n there is a latent (hidden) variable z_n with values 1, ..., K representing its cluster (or class). Conditional on z_n, x_n is drawn from a Gaussian distribution with mean and co-variance matrix depending on the class z_n. The EM algorithm attempts to find the configuration of the z_n's that maximizes the overall likelihood. In your example, you're generating data from a mixture of two distributions: orange and blue, so K=2. 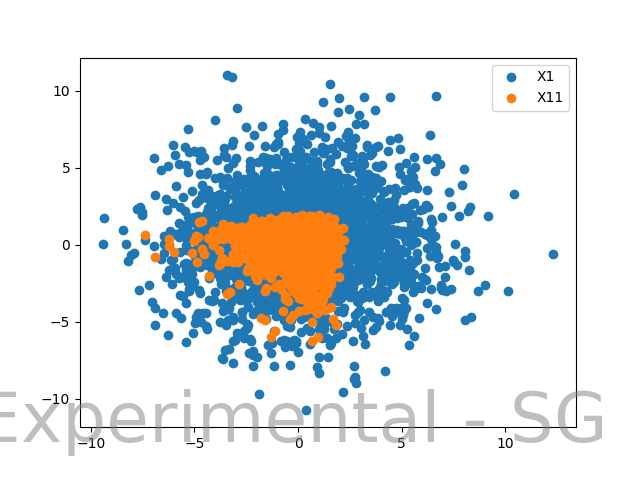 Orange and blue are not strictly Gaussian, but close enough. 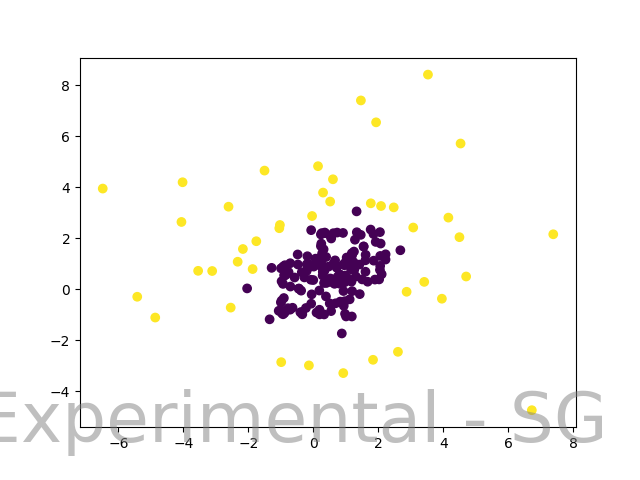 Accordingly, in both cases (even with only few data) the mixture model picks up that there is one distribution with a bigger variance (yellow) and one with a smaller variance (purple). By design, K-means has no chance of picking up this pattern. For the two clusters you generate, determine the pdf (probability density function) each. Now plot a heatmap of pdf1(x,y)-pdf2(x,y). Assuming a red-white-blue heatmap, red areas are more likely to belong to one clusters blue areas to the other. That is the "real" ground truth that you are working with: lots of points in "white" that cannot be clearly assigned to either cluster. You then can also do the same for the clustering result of EM. If visual contrast is not good enough, use log(pdf1(x)/pdf2(x)) instead. On the analytical side, compare the average squared difference between the two clusters to the average squared difference within each cluster. If the first is not substantially larger than the second, the clusters can likely not be separated well! Not the answer you're looking for? Browse other questions tagged clustering python k-means expectation-maximization gaussian-mixture or ask your own question. When would I use EM instead of k-means? Why is the expectation maximization algorithm used? What clustering algorithm should I use for clusters spaced on a grid? Does the expectation maximization algorithm apply to this problem?